Princesses are going to have fun playing board games. Prepare for the exciting evening and dress up princesses, so they will feel comfortable during the night! 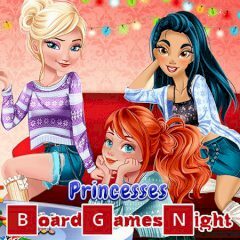 This night is going to be funny, because princesses have brought board games with them. Help them to get ready and prepare all the stuff, so nothing will prevent them from having fun!